Do you know what’s happening around you in the market and are you interested in watching movies, dining outside and nightlife? Today, people are doing everything digitally. Whether they want to book, a movie show, shop goods, send payments online, etc., they are going digital. Everyone prefers to get everything they need via online mode. Because there are lots of facilities available today, people are so much dependent online. Is this a positive aspect or a negative one? Well, whatever your answer is, this technology has solved the problems of many people while coping with their busy life. They are enjoying a little more with the help of online facilities. For example- when you’re getting bored, you go outside, watch movies and pre book tickets via online modes, order food at home or dine out. So, what I want to say is that online facilities connect you with people, you can see what’s happening around you, what people like, find what’s next, etc. Likewise, there is a web app for you which truly justifies it. It’s none other than “The Spoke”, which is an app that helps people figure out what’s next such as movies, dining, nightlife, etc. You only need to create an account with the Spoke and get started. You can Login after creating an account and choose an option between the watch and Eat and Drink. If you choose to watch, you can discover movies and give likes or dislikes by rating them and mark your favorite movies or the movies which you’ve watched earlier. If you haven’t watched a latest movie than you can see their show timings near you and book accordingly. Similarly, if you choose to eat and drink, want to eat some good food and your favorite dishes outside,, you can see the top most restaurants, bars, cafe around you within minutes. All you need is to put your address where you want the food. You can see the Spoke score where search results are based on the people you trust, not an algorithm. You can also invite your friends to join the app. With, the Spoke you’ll be able to discover what’s trending, top picks from friends and make a list to save for later. You can also filter by a variety of streaming videos like movies, TV shows, reality shows, etc. and other delivery resources, genres and cuisines, and even release year. The Spoke basically digitizes the best recommendation process- word of mouth, in a digestible way, and injects authenticity into the mix. The Spoke gives preferences to your friends instead of millions of anonymous users, weighting their likes and dislikes more heavily than those of randoms. Overall, I would say that, the Spoke is a best way to discover what’s next around you. You’ll be always up to date with the latest videos and movies streaming all around the world without searching here and there. Moreover, it’s an all in one tool for discovering videos with their ratings as well as finding restaurants near you! PROS: helps to discover latest videos; find the best restaurants and get food easily; invite friends; based on likes and dislikes of videos; filter a variety of streaming videos, TV shows, etc. ; free to use. 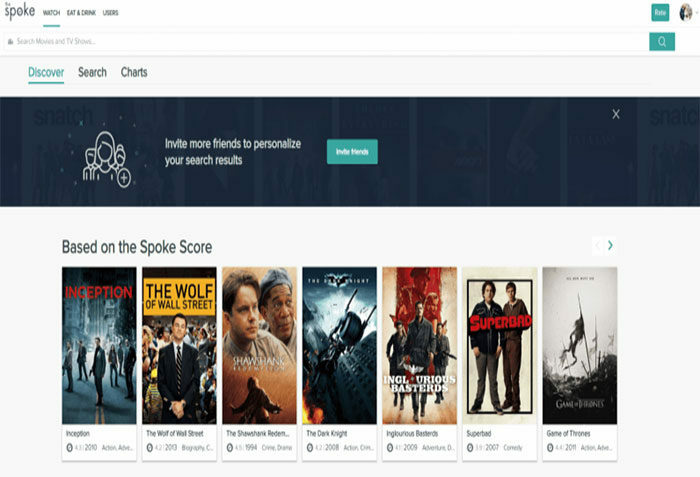 The Spoke, which is an app that helps people figure out what’s next such as movies, dining, nightlife, etc. You only need to create an account with the Spoke and get started. You can Login after creating an account and choose an option between the watch and Eat and Drink.